Racky Plews directs brand new musical Knights of the Rose, playing at the West End’s Arts Theatre for a strictly limited 9-week season. 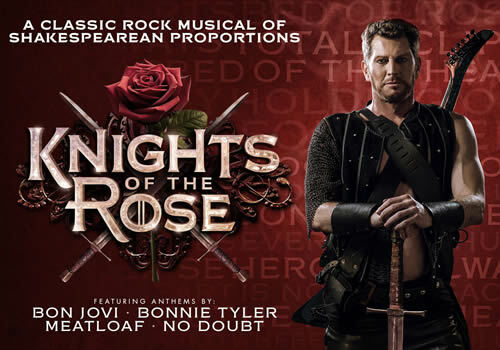 Produced by Romance of the Rose Productions, the world premiere is an epic medieval tale featuring a back catalogue of timeless classics, including artists Bon Jovi, Bonnie Tyler and Black Sabbath. A thrilling tale of love, betrayal and redemption, Knights of the Rose sees the noble Knights in a bloodthirsty battle to defend their house and honour. But despite a triumphant return, there is a greater threat to the kingdom afoot. As the greatest battle of all time prepares to tear their band of brothers apart, can true love and real honour triumph over evil? Headlined by 5 inimitable Bon Jovi songs, including “Blaze of Glory”, “Blood on Blood”, “Bed of Roses” and more, the jukebox musical encapsulates songs of the 80’s and 90’s. Toe-tapping tunes include Bonnie Tyler’s “Holding Out for a Hero”, “Total Eclipse of the Heart”, Meat Loaf’s “Is Nothing Sacred”, “Don’t Speak” by No Doubt and many, many more. Casting includes Adam Pearce, Chris Cowley, Oliver Saville, Rebecca Bainbridge, Rebekah Lowings, Matt Thorpe, Ruben Van Keer, Kate Birtill and Bleu Woodward, as well as Ian Gareth Jones, Kelly Hampson and Tom Bales. Knights of the Rose is directed and choreographed by Racky Plews, whose credits include the West End and UK tour of American Idiot, as well as national tours of Thoroughly Modern Millie, Footloose and Summer Holiday. The production also features design by Diego Pitarch and is created by Jennifer Marsden. With interwoven literature from historical greats Shakespeare, Marlowe and Chaucer, Knights of the Rose is the high-octane new musical of epic proportions, combining medieval rock with pop culture. Playing for a strictly limited season, the production runs at the Arts Theatre from June 29th to August 26th 2018, with an official opening on July 5th 2018. Knights of the Rose is recommended for ages 12 and above.